I recently launched a new WordPress site running on IIS (yes, you read correctly). The web host had ISAP Rewrite installed so we planned to use that to support Apache mod_rewrite rules. I assumed the same syntax would work in .htaccess using ISAPI Rewrite. WRONG! It turns out that the Redirect directive is part of Apache mod_alias and not part of mod_rewrite. So, how do you do a 301 redirect using mod_rewrite? You can do all sorts of crazy URL rewriting using mod_rewrite but I just wanted to do a simple page to page redirect! I hope this helps if you are trying to do a 301 redirect using ISAPI Rewrite. Anyway, it turns out that when you are issued your SSL cert you are also issued an intermediate certificate. My webhost had that box listed as optional and I didn’t have the intermediate cert filled in. Once I entered the intermediate certificate the errors in Firefox went away. Took a few minutes to refresh. I hope this helps anyone in the same situation. 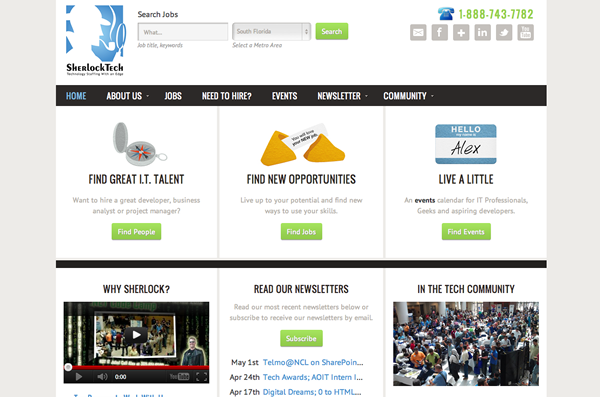 For the past few months I’ve been part of a team redesigning Sherlock Tech’s new website. SherlockTech Staffing is a boutique IT staffing and consulting agency for technical talent in Florida and other parts of the country. I got involved with the project after running into a David Silverlight at the local WordPress meetup. I had worked with David many years ago and knew he was an excellent .Net and Silverlight developer so I was surprised to see him at a WordPress meetup. It turns out that David is working with WordPress now and was scouting out some plugin ideas for some of his sites. David introduced me to Alex Funkhouser Sherlock Tech’s President and I teamed up with Media In Sync and Steve Earle to work on the site. Marsha Belinson, an Account Director with Sherlock served as the creative director/project manager for the redesign. Mobile support was a priority for Marsha and I recommended using a responsive design. I have been using the Genesis Theme framework from StudioPress for years and they had recently launched several new themes that were responsive. We selected the Genesis Streamline child theme and customized it to give Sherlock Tech their own unique branding. Sherlock Tech uses a recruiting app called Sendouts to publish their open positions and track applicants. Sherlock wanted to use the Sendouts API to import open positions and add them as content on their new WordPress site. I created a custom post type to handle jobs and wrote a custom WordPress plugin to run each hour using the WP cron. The service pulls open jobs from Sendouts and synchronizes them with the existing custom posts on the WordPress site. Jobs are searchable on the Sherlock site and applicants then apply through the Sendouts app. This was definitely one of the more challenging projects I have worked on in recent months. In my experience the key to a successful project is having good project leadership. Alex and Marsha provided clear direction on what they wanted and we launched on time and within budget. Over the past year I have seen a need to get all the talented people in the WordPress community connected with employers who are looking to hire. Last week I finally put in some sweat equity to launch WPWorkforce. Job seekers can create a free profile and resume that employers can use to view their skills. Employers can post jobs for positions requiring WordPress experience. Right now job posting is FREE on WPWorkforce.com so get to it! 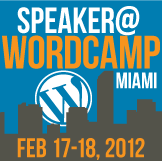 I’ll be presenting at WordCamp Miami 2012 on February 17 & 18. WordCamp will be a a two-day event this year. Friday will include introductory workshops for beginners and Saturday will include more advanced topics for bloggers, designers, power users and developers. This year I was able to help out with the volunteer team and did the CSS styling work and content admin for the WordCamp Miami website. It presented a unique challenge since I did not have access to the php code in the theme. All I was able to modify was the site CSS. If you want to see how powerful CSS is, take a look at some of the other recent WordCamp sites like San Fransisco, Orlando, Portland, Phoenix and Atlanta. Everyone one of these sites, including Miami use the same WordPress theme but have their own unique style by modifying the CSS.